This article is about the bacterial genus. For the bacterial class, see Bacilli. For rod-shaped bacteria in general, see Bacillus (shape). For the insect genus, see Bacillus (insect). Bacillus (Latin "stick") is a genus of Gram-positive, rod-shaped bacteria, a member of the phylum Firmicutes, with 266 named species. The term is also used to describe the shape (rod) of certain bacteria; and the plural Bacilli is the name of the class of bacteria to which this genus belongs. Bacillus species can be either obligate aerobes: oxygen dependent; or facultative anaerobes: having the ability to be anaerobic in the absence of oxygen. Cultured Bacillus species test positive for the enzyme catalase if oxygen has been used or is present. Bacillus can reduce themselves to oval endospores and can remain in this dormant state for years. The endospore of one species from Morocco is reported to have survived being heated to 420o C.  Endospore formation is usually triggered by a lack of nutrients: the bacterium divides within its cell wall, and one side then engulfs the other. They are not true spores (i.e., not an offspring). Endospore formation originally defined the genus, but not all such species are closely related, and many species have been moved to other genera of the Firmicutes. 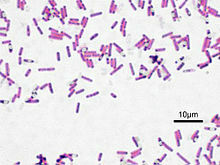 Ubiquitous in nature, Bacillus includes both free-living (nonparasitic) species, and two parasitic pathogenic species. These two Bacillus species are medically significant: B. anthracis causes anthrax; and B. cereus causes food poisoning. Many species of Bacillus can produce copious amounts of enzymes which are used in various industries, such as the production of alpha amylase used in starch hydrolysis, and the protease subtilisin used in detergents. B. subtilis is a valuable model for bacterial research. The cell wall of Bacillus is a structure on the outside of the cell that forms the second barrier between the bacterium and the environment, and at the same time maintains the rod shape and withstands the pressure generated by the cell's turgor. The cell wall is composed of teichoic and teichuronic acids. B. subtilis is the first bacterium for which the role of an actin-like cytoskeleton in cell shape determination and peptidoglycan synthesis was identified, and for which the entire set of peptidoglycan-synthesizing enzymes was localised. The role of the cytoskeleton in shape generation and maintenance is important. The genus Bacillus was named in 1835 by Christian Gottfried Ehrenberg, to contain rod-shaped (bacillus) bacteria. He had seven years earlier named the genus Bacterium. Bacillus was later amended by Ferdinand Cohn to further describe them as spore-forming, Gram-positive, aerobic or facultatively anaerobic bacteria. Like other genera associated with the early history of microbiology, such as Pseudomonas and Vibrio, the 266 species of Bacillus are ubiquitous. The genus has a very large ribosomal 16S diversity. An easy way to isolate Bacillus species is by placing nonsterile soil in a test tube with water, shaking, placing in melted mannitol salt agar, and incubating at room temperature for at least a day. Cultured colonies are usually large, spreading, and irregularly shaped. Under the microscope, the Bacillus cells appear as rods, and a substantial portion of the cells usually contain oval endospores at one end, making them bulge. Three proposals have been presented as representing the phylogeny of the genus Bacillus. The first proposal, presented in 2003, is a Bacillus-specific study, with the most diversity covered using 16S and the ITS regions. It divides the genus into 10 groups. This includes the nested genera Paenibacillus, Brevibacillus, Geobacillus, Marinibacillus and Virgibacillus. The second proposal, presented in 2008, constructed a 16S (and 23S if available) tree of all validated species. The genus Bacillus contains a very large number of nested taxa and majorly in both 16S and 23S. It is paraphyletic to the Lactobacillales (Lactobacillus, Streptococcus, Staphylococcus, Listeria, etc. ), due to Bacillus coahuilensis and others. A third proposal, presented in 2010, was a gene concatenation study, and found results similar to the 2008 proposal, but with a much more limited number of species in terms of groups. (This scheme used Listeria as an outgroup, so in light of the ARB tree, it may be "inside-out"). One clade, formed by B. anthracis, B. cereus, B. mycoides, B. pseudomycoides, B. thuringiensis, and B. weihenstephanensis under the 2011 classification standards, should be a single species (within 97% 16S identity), but due to medical reasons, they are considered separate species:34–35 (an issue also present for four species of Shigella and Escherichia coli). Bacillus species are ubiquitous in nature, e.g. in soil. They can occur in extreme environments such as high pH (B. alcalophilus), high temperature (B. thermophilus), and high salt concentrations (B. halodurans). B. thuringiensis produces a toxin that can kill insects and thus has been used as insecticide. B. siamensis has antimicrobial compounds that inhibit plant pathogens, such as the fungi Rhizoctonia solani and Botrytis cinerea, and they promote plant growth by volatile emissions. Some species of Bacillus are naturally competent for DNA uptake by transformation. Two Bacillus species are medically significant: B. anthracis, which causes anthrax; and B. cereus, which causes food poisoning, with symptoms similar to that caused by Staphylococcus. B. thuringiensis is an important insect pathogen, and is sometimes used to control insect pests. B. subtilis is an important model organism. It is also a notable food spoiler, causing ropiness in bread and related food. Some environmental and commercial strains of B. coagulans may play a role in food spoilage of highly acidic, tomato-based products. Many Bacillus species are able to secrete large quantities of enzymes. Bacillus amyloliquefaciens is the source of a natural antibiotic protein barnase (a ribonuclease), alpha amylase used in starch hydrolysis, the protease subtilisin used with detergents, and the BamH1 restriction enzyme used in DNA research. A portion of the Bacillus thuringiensis genome was incorporated into corn (and cotton) crops. The resulting GMOs are resistant to some insect pests. 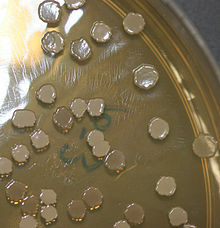 Colonies of the model species Bacillus subtilis on an agar plate. Bacillus subtilis is one of the best understood prokaryotes, in terms of molecular and cellular biology. Its superb genetic amenability and relatively large size have provided the powerful tools required to investigate a bacterium from all possible aspects. Recent improvements in fluorescent microscopy techniques have provided novel insight into the dynamic structure of a single cell organism. Research on B. subtilis has been at the forefront of bacterial molecular biology and cytology, and the organism is a model for differentiation, gene/protein regulation, and cell cycle events in bacteria. Paenibacillus and Virgibacillus, genera of bacteria formerly included in Bacillus. ^ a b (in German) Cohn F.: Untersuchungen über Bakterien. Beitrage zur Biologie der Pflanzen Heft 2, 1872, 1, 127-224. ^ Loshon, Charles A.; Beary, Katherine E.; Gouveia, Kristine; Grey, Elizabeth Z.; Santiago-Lara, Leticia M.; Setlow, Peter (March 1998). "Nucleotide sequence of the sspE genes coding for γ-type small, acid-soluble spore proteins from the round-spore-forming bacteria Bacillus aminovorans, Sporosarcina halophila and S. ureae". Biochimica et Biophysica Acta (BBA) - Gene Structure and Expression. 1396 (2): 148–152. doi:10.1016/S0167-4781(97)00204-2. ^ Turnbull PCB (1996). Baron S; et al. (eds.). Bacillus. In: Barron's Medical Microbiology (4th ed.). Univ of Texas Medical Branch. ISBN 978-0-9631172-1-2. ^ "Bacterial Endospores". Cornell University College of Agriculture and Life Sciences, Department of Microbiology. Retrieved October 21, 2018. ^ Madigan M; Martinko J, eds. (2005). Brock Biology of Microorganisms (11th ed.). Prentice Hall. ISBN 978-0-13-144329-7. ^ Xu, D.; Cote, J. -C. (2003). "Phylogenetic relationships between Bacillus species and related genera inferred from comparison of 3' end 16S rDNA and 5' end 16S-23S ITS nucleotide sequences". International Journal of Systematic and Evolutionary Microbiology. 53 (3): 695–704. doi:10.1099/Ijs.0.02346-0. PMID 12807189. ^ Yarza, P.; Richter, M.; Peplies, J. R.; Euzeby, J.; Amann, R.; Schleifer, K. H.; Ludwig, W.; Glöckner, F. O.; Rosselló-Móra, R. (2008). "The All-Species Living Tree project: A 16S rRNA-based phylogenetic tree of all sequenced type strains". Systematic and Applied Microbiology. 31 (4): 241–250. doi:10.1016/j.syapm.2008.07.001. hdl:10261/103580. PMID 18692976. ^ Yarza, P.; Ludwig, W.; Euzéby, J.; Amann, R.; Schleifer, K. H.; Glöckner, F. O.; Rosselló-Móra, R. (2010). "Update of the All-Species Living Tree Project based on 16S and 23S rRNA sequence analyses". Systematic and Applied Microbiology. 33 (6): 291–299. doi:10.1016/j.syapm.2010.08.001. hdl:10261/54801. PMID 20817437. ^ a b Alcaraz, L.; Moreno-Hagelsieb, G.; Eguiarte, L. E.; Souza, V.; Herrera-Estrella, L.; Olmedo, G. (2010). "Understanding the evolutionary relationships and major traits of Bacillus through comparative genomics". BMC Genomics. 11: 332. doi:10.1186/1471-2164-11-332. PMC 2890564. PMID 20504335. 1471216411332. ^ Jeong, Haeyoung; Jeong, Da-Eun; Kim, Sun Hong; Song, Geun Cheol; Park, Soo-Young; Ryu, Choong-Min; Park, Seung-Hwan; Choi, Soo-Keun (2012-08-01). "Draft Genome Sequence of the Plant Growth-Promoting Bacterium Bacillus siamensis KCTC 13613T". Journal of Bacteriology. 194 (15): 4148–4149. doi:10.1128/JB.00805-12. ISSN 0021-9193. PMC 3416560. PMID 22815459. ^ Keen, E; Bliskovsky, V; Adhya, S; Dantas, G (2017). "Draft genome sequence of the naturally competent Bacillus simplex strain WY10". Genome Announcements. 5 (46): e01295–17. doi:10.1128/genomeA.01295-17. PMC 5690344. PMID 29146837. ^ Graumann P, ed. (2012). Bacillus: Cellular and Molecular Biology (2nd ed.). Caister Academic Press. ISBN 978-1-904455-97-4. .
^ Ash, Carol; Priest, Fergus G.; Collins, M. David (1994). "Molecular identification of rRNA group 3 bacilli (Ash, Farrow, Wallbanks and Collins) using a PCR probe test". Antonie van Leeuwenhoek. 64 (3–4): 253–260. doi:10.1007/BF00873085. ^ Heyndrickx, M.; Lebbe, L.; Kersters, K.; De Vos, P.; Forsyth, G.; Logan, N. A. (1 January 1998). "Virgibacillus: a new genus to accommodate Bacillus pantothenticus (Proom and Knight 1950). Emended description of Virgibacillus pantothenticus". International Journal of Systematic Bacteriology. 48 (1): 99–106. doi:10.1099/00207713-48-1-99. Wikimedia Commons has media related to Bacillus.